You don’t need to be a professional cartographer or designer to create stunning and great-looking maps within minutes – be it city maps, trail maps, direction maps, touristic maps or general overview maps. 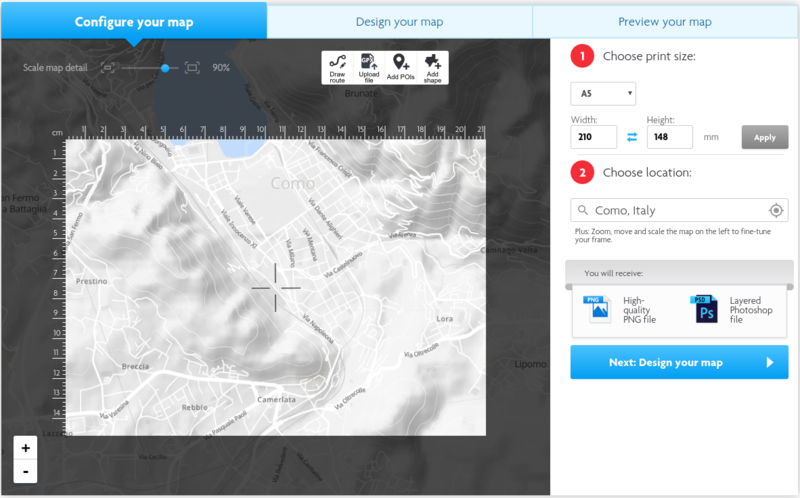 We promise: The Printmaps map editor will save you many hours in map drawing and route tracing. Map scales from whole world to 1:1000 (individual houses) You can use 22 zoom levels and the Scale tool to achieve the exact map scale that you need for your print job. The zoom levels change the level of feature detail in the map while the scale tool scales down those features in size. Choose from many predefined map styles We offer predefined map styles especially suitable for winter and summer tourism, city maps, cycling, hiking or simple overview maps. Choose a map style and then fine-tune it showing/hiding individual features. Use printable aerial photos as map background (selected countries) You can print high-level satellite pictures worldwide plus high-res aerial photos (orthophotos) in selected countries such as Austria. We are working on providing orthophotos for more regions of the world. Individually show or hide every map feature You can choose to hide specific map features such as borders, labels, street casings, hillshading and many more. You will imediately see the effect in the Design Map tab. The remaining features will be available as separate layers in the Photoshop file. Scale down map detail up to 50% Scale the map between 100% and 50% to reduce the size of labels and other map features and to fit more area into your print output size. Rotate map Rotate the map for special purposes. Example: You want to print the New York Central Park horizontally. Useful also for maps of valleys or travel itineraries. Print a map from any place of the world Printmaps.net works worldwide. 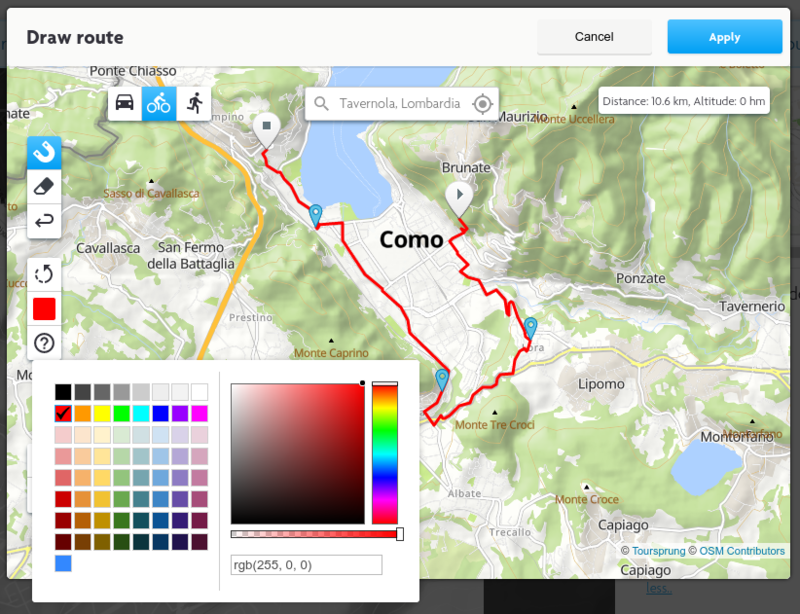 Draw a route with magnet tool Want to map a car/bike/hiking route and don't have the GPS data? No problem: Use the magnet tool to quickly draw the route, snapping along roads. The car/bike/walk mode makes sure the right roads are used. 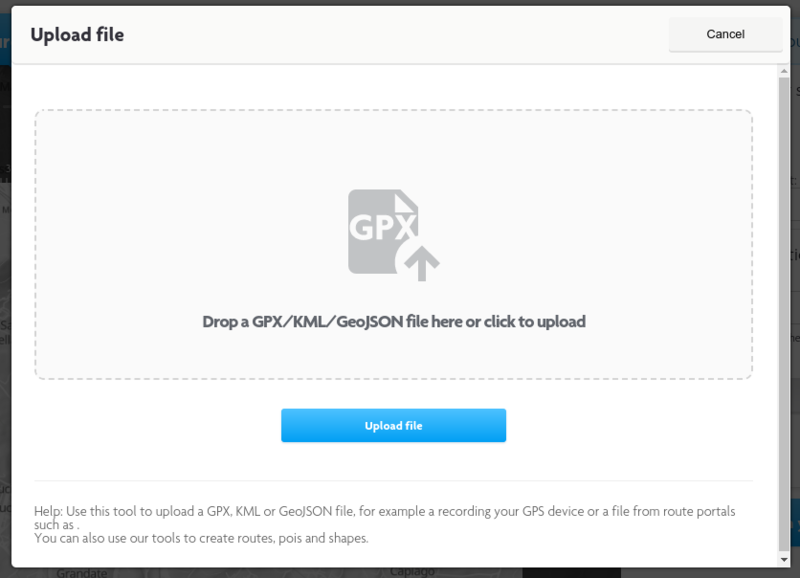 Upload GPX file Have a GPX file with your geo content? Upload to render it onto your map. Upload GeoJSON file Have a GeoJSON file with your geo content? Upload to render it onto your map. Upload KML file Have a KML file with your geo content? Upload to render it onto your map. Add POIs Use the POI tool to plot up to 300 POIs onto your map. You can add POIs manually or copy-paste them from your Excel sheet. No coordinates needed, Printmaps geocodes the points for you. You can choose hundreds of different markers in variable size and color. Batch Geocoding You can use the POI tool to add up to 300 addresses or places and have them batch geocoded by us in real time. 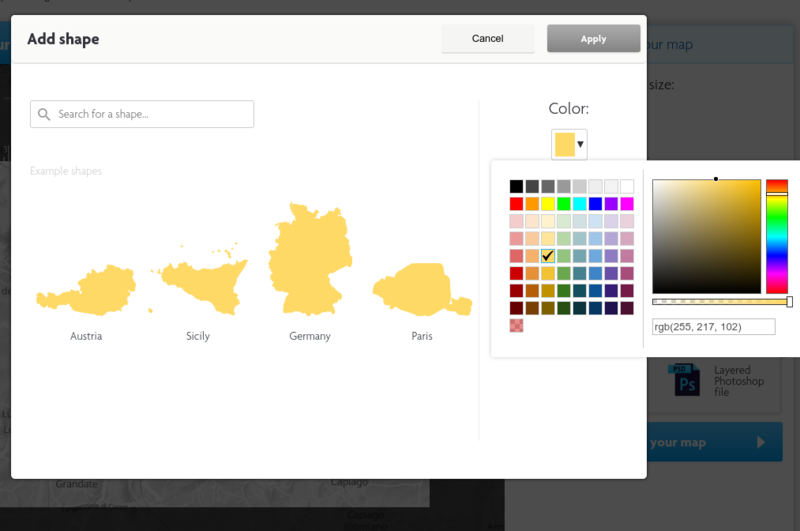 Add geographic shapes Want to highlight the bounds or a city or the borders of a country or region? Just search for that administrative area and then select how you want to show it (colors/outline/transparency, inverted or not). Maps up to 330mm x 330mm in size You can choose any output size up to a max. side length of 330mm. 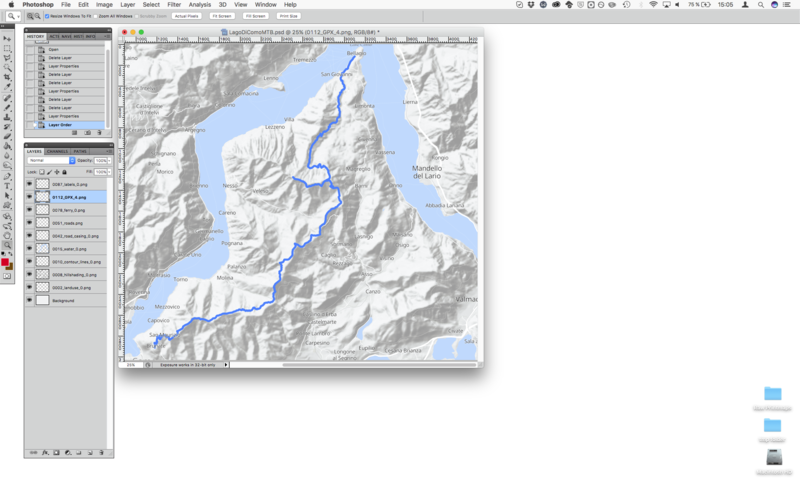 If you need bigger output sizes you can stich together maps in Photoshop. 300 dpi All PNGs and PSDs are in calculated in 300dpi high-res, fit to print. High-res PNG You will get a high-res PNG file, ready to print. The PNG exactly resembles the smaller size preview image on the third tab. Layered PSD You will get a high-res Photoshop file (PSD) with all map features and all of your content in separate layers. 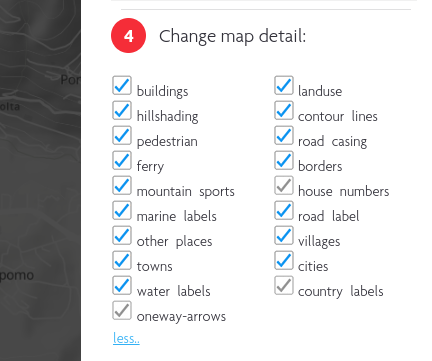 This way you can edit labels and other map features without affecting the map features below. All content (including every POI) as separate layer All map features and all of your content - including individual POI markers - come in separate PSD layers. This way you can edit labels and other map features in Photoshop without affecting the map features below. Max. print circulation Choose the licence that fits your print project. For repeat use or large print jobs choose the Unlimited licence. We provide worldwide cartography with all zoom levels. So go as high or as deep as you want! We generate layered PSD-files for every map. Edit features in Photoshop, even after creating your map in our online editor. Your map, your style. 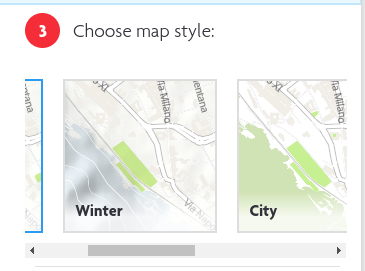 Choose between a number of map styles, from full terrain to winter and city styles. 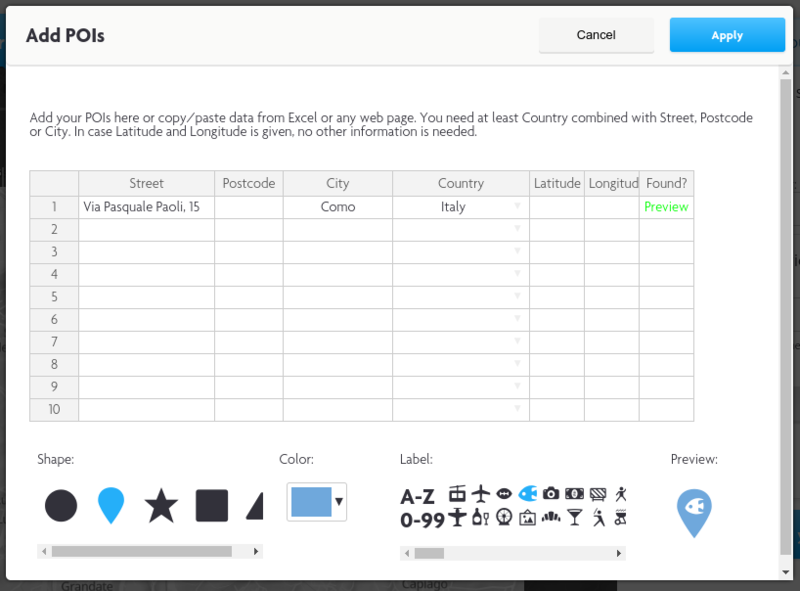 Choose your own design by checking or unchecking the items you want to be included in your map. It doesn’t get much easier than that. Want to include a route in your map? It’s as easy as using our magnetic drawing tool. More into freehand? No worries, we support that as well. Have a GPX or KML you want to be included in your map? No problem, you can upload as many as you like and have them displayed on your map. Want to outline regions or cities? Use our pre-configured shapes, give them borders or not or even invert them to make them more prominent. Have a number of POIs you want to include in your map? Use our POI-wizard and include them in no time, then choose from a number of colors and icons to style them.